Although I don't believe in NY resolutions I have wanted to do something more serious with my blog for a while and there's no time like the present. Initially I thought I'd be doing reviews and such. But frankly I find that a bit boring...and most questions regarding my dresses etc comes on IG anyway. When it comes to dresses I'm a much better Instagrammer than I am blogger it seems ;) So I also changed the name of the blog as you might have noticed. Not gonna lie, you guys. I constantly hope that I inspire my little patrons. They don’t have to want to become librarians themselves (that is the dream though haha), but I hope they remember me and that it was a good experience meeting me. The funny thing is as while parents usually want the best for children – quite often I find that they hinder the child’s process in finding that perfect book because they are stressed and busy and often don’t have the time for the child to express herself. Instead they speak on their behalf and while I’m sure parents know their child very well, I’m also quite sure that often they don’t know everything. I’ve had parents cut their kid off saying things like: Snakes? Nonsense, I’ve never heard you express any interest in snakes before. And the child doesn’t get to explore new interests. Now I have no children and therefore I can only imagine how busy such a life is and I don’t judge the parents. But it does hurt my bookworm heart that childrens curiosity and need to explore often is squished under everyday life. I don’t know if my red lips and big colourful, quirky dresses do my any favours – some of the smaller girls might see me as a princess but the pre/teen boys who come to use the computers are rather unimpressed. I might even make a comical figure for them – so be it - and most adult are somwhat outlandish figures to kids anyway. I had to scold some boys the other days for swearing (it doesn't bother me but there was smaller kids present, so I thought I better make an example for them) and they didn't really look as though they took me very seriously. There could be a number of reasons for that though - that I'm relatively young, that I'm new so they are testing my boundaries... or that one of them made me laugh in the middle of me reprimanding them by noticing my accent and asking where I was from (I'm born and raised in Northern Jutland and although we all speak the same language we have accents just as any other country and mine becomes more prenounced when I'm angry or scared - and frankly having to be all adult and scolding made me both ;) ). Anyways, I know I dress funny and I know I’m not making it easy for myself to be taken seriously for people who don’t know me. I manage to because I may be dressed like a 2 year old (funny story, a coworkers two year old daughter have a coat just like mine only red instead of green - she also has a yellow dress with a strawberry print. Guess who else has a dress in a print like that?) but I’m also very professional, I have strong opinions about the tasks of a library/librarian and I am pretty damn good at my job. I consider librarians somewhat equal to teachers in the shaping and teaching our next generations - except we get the good task. The kids often come to us more or less volentarily – and as many kids look up to their teachers so I hope I become a role model to the kids in their quests of literature. There’s no doubt that in my recommendations and guidance I am currently best equipped to deal with older children who are good at reading. So my personal challenges right now are to get a better understanding of different ages and what children at those ages are able to read by them selves and that's what I'm working on this last month I still have a job. This month I get to try out being very grown up and just an ordinary librarian (if there is such a thing). I'm kinda nervous but I think it'll be fun and either way I'm not afraid of challenges :) And I'll still have some hours in the children's library. Edit: After I wrote the above I actually had a shift in the adult library and the only question I couldn't answer came from - a child haha. How many books do you have in the entire library? A lot, little grasshopper. A whole lot. Still hoping my current library suddenly finds a lot of money and hire me permanently but sadly that's probably not going to happen. But I like it here and I've had time to settle in. It's so cruel to kick me out in the cold haha ;) Either way I'm so happy they took me in and gave me a chance to find out what I wanted to do with the rest of my life. 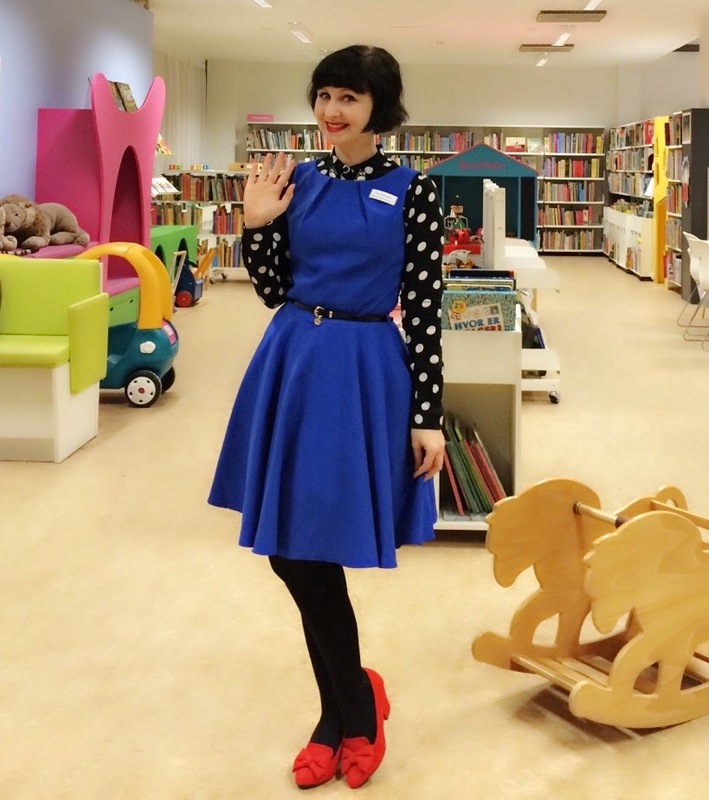 I had an idea I wanted to be a children's librarian but I had never worked as one before. I could have hated it hehe - but it turned out to be my dream job. Now to find that permanent position.... Bring it on, 2015.
but it was ever so cold! 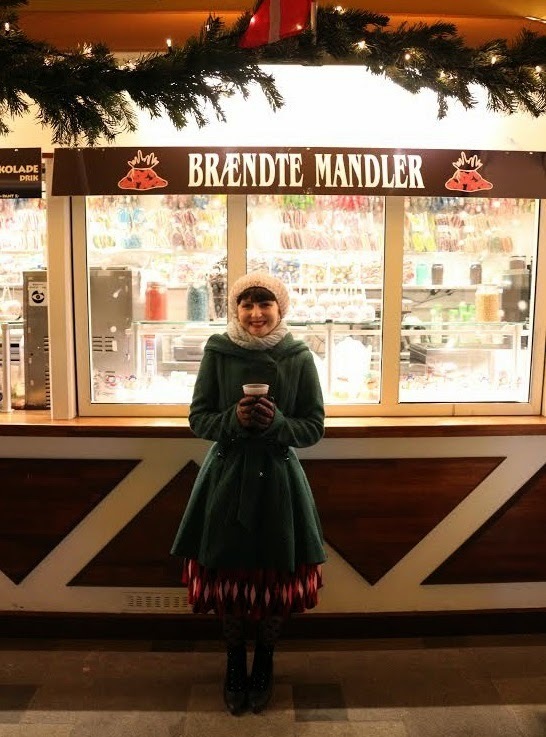 Miss Burned Almond 2015 with mulled wine and a smile. Good luck with the new possible ventures! It's an exciting and nervous time for you! I really wanted the pencil shoes Modcloth carried (perhaps still do?) but I thought they were a tad expensive for a novelty shoe hehe. Gah! Dream job indeed. Being surrounded by books all day sounds wonderful. I hope you find a permanent position. And your outfits are really just darling, they should make you feel ready to take on the world. :3 You can do it!